There are two facets of grading coins that are frequently discussed at coin fairs and exhibitions – condition and rarity ! The former is relatively straight forward (albeit subject to several different standards) whereas the latter is often the subject of spirited debate. In order to address both, I will deal with them separately. Being a specialist in Irish coins and coin tokens, I will show examples of Irish coins – there are plenty of other articles on foreign coin grading and I will leave these coins to their specialist students. There is a third factor that over-rides both condition and rarity – interest factor. There are many examples of instances where the “interest factor” determines the price and seems counter-intuitive to the opinions formed when assessing condition and rarity. I will deal with this last. With the exception of special commemorative issues and proofs, coins are essentially made for public circulation, i.e. to enable commerce to take place. Depending upon the size of the economy, they are made in large quantities and are not usually rare. 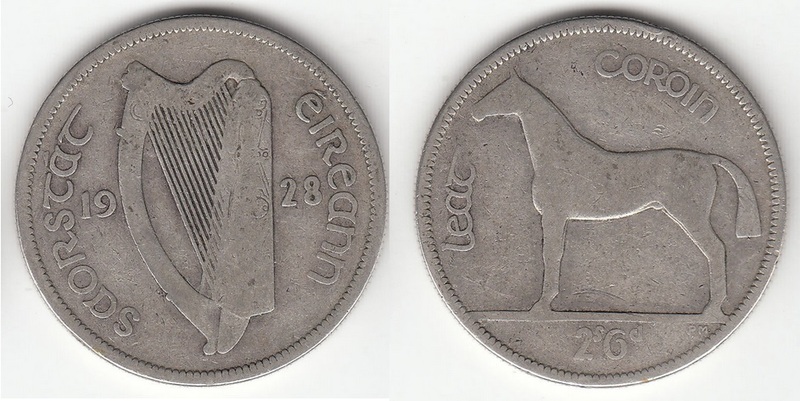 For example, if we look at the largest denomination of coins in 1928 (when the Irish Free State first issued coins) and 2002 (when Ireland launched the Euro coinage) we can see that there were just over 2 million halfcrowns minted, as opposed to almost 60 million of the new €2 coins minted, respectively. Even allowing for inflation, the Irish economy has clearly grown and multiplied. It is generally recommended that collectors acquire examples of a coin in the best condition that their budget can afford. However, up until recently grading coins was a very inexact science and coin grading generated heated debate – especially when the seller and buyer disagreed on how good or bad a coin really was ! It seems to be a universal law that the seller over-grades and the buyer under-grades. Normal use causes the surface of a coin to be smoothed and for the detail to be gradually lost. Eventually, a coin can be worn almost flat and completely devoid of any design detail. Coins often suffer damage beyond normal wear, i.e. from being subjected to damage and/or being used for purposes other than intended. For example holes and edge damage from being made into jewellery. However, damage is more commonly attributed to being dropped (edge knocks). Edge knocks are often caused when heavy coins (particularly those made from soft metals such as gold and silver) when dropped on to hard surfaces. Most coin metals begin to react with the environment as soon as they are minted. Oxygen is a very corrosive gas and most metallic surfaces oxidize very slowly if left exposed to air. This reaction initially results in toning of the coin’s original colour, e.g. silver coins will eventually turn dark grey/black in colour. There is also a very weak acid in the sweat on our hands and this particularly affects copper coinage that has been handled (or circulated). If a coin is lost and buried in the ground, corrosion may be much more substantial, e.g. pitting of the surface and loss of metal from the coin. Corrosion is also a long-term factor that should be considered when purchasing coin holders, wallets, albums and cabinets. It is also a factor that is often overlooked when designing presentation packs by Mints, Central Banks and other coin issuing authorities, e.g. the Irish 1986 decimal coinage set was sealed, so the coins cannot be easily removed – unfortunately the glue used tends to remain sticky and many sets have been damaged by glue leaking out of the top or the bottom of the folder – depending on how they were stored by collectors. Initially, coins should be graded on the amount of wear. This (initial) grade should then be modified or qualified to indicate any damage or corrosion. To the non-coin collector, coin grading terms might rightly be considered to be confusing and/or just plain silly. For example, a coin deemed to be in Good condition by a numismatist is actually not very good at all. In fact, this condition is down near to the bottom of the grading scales. Most collectors would not want a coin in this condition –unless it was a great rarity like the 1943 Irish florin ! As already mentioned, grading coins used to be a vexing subject, so over the years a method and associated terminology was developed to describe coin grades. As is the norm when trying to set international standards, many systems were proposed and now two systems predominate. However, it is highly unlikely that these two groups of people (American and European) will ever agree a single format. However, even with these concise definitions, there is still plenty of room for disagreement. The main differences between the two scales occur in the Good Very Fine (GVF) to Extremely Fine (EF) range and, because the American scale is very liberal with these intermediary grades, the two systems have a significant gap between Extremely Fine (EF) and Uncirculated (Unc) which is filled with an additional grade: Almost Uncirculated (AU) – not to be confused with the scientific symbol for gold Au on the Periodic Table. For example ‘Good Very Fine‘ is a coin which is better than ‘Very Fine’ and is a grade in its own right in the European scale, whereas ‘Nice Very Fine‘ means the coin is in ‘Very Fine’ condition but is particularly nice for this grade (perhaps because of attractive toning or being particularly free of the normal minor scratches a coin in this grade would have). Sometimes ‘Nice Very Fine’ means that the grader would have liked to grade the coin ‘Good Very Fine’ but the level of wear indicated it is only ‘Very Fine’. The gaps in the American system allows for these additional “intermediate” grades. Good Extremely Fine AU-55 Very light wear on higher points – attractive colour (original or toned) – usually requires a glass to actually see the wear – may just be a loss of mint bloom on some surfaces. Extremely Fine AU-50 Light wear on highest points – mint bloom still largely present. About Extremely Fine XF-45 Areas of wear on highest points but no fine details is lost. Fields may show contact pattern or central toning on copper or CuNi. Good Very Fine XF-40 Wear is beginning to cause fine detail to be lost – usually only traces of lustre, if any. Fields are generally dulled. Very Fine VF-30 Wear is clear and finer detail is generally lost. The coins is still attractive and there is lots of ‘depth’ to the designs. About Very Fine VF-20 Wear is clear and is beginning to affect the appearance of the designs – areas of wear are beginning to extend from the higher points. Good Fine F-16 Wear is extending over much of the design but the main detail is still visible and there is still fine detail in protected areas. Fine F-12 Wear generally covers all the main design features with only main details still clear – the main designs and legends are still clearly standing out from the fields. About Fine AF-10 Wear generally covers all the main design features with not all main details still clear – the main designs and legends are still clear and generally standing out from the fields. Very Good VG-8 Designs are becoming silhouettes – a few large details may still be visible. No actual loss of design outline. Good G-6 Design may be worn into fields at a few points but outline is generally clear – usually no details left. Fair G-4 Usually only silhouettes with soft outlines – however all design and legend is still visible. Poor AG-3 Much of design and legend is merged into fields – but enough remains to identify, i.e. the date is identifiable. – P-1 Only traces of design outlines – identity may be type but not date. When a coin is minted the surface generally has a sheen or bloom which shows as softly lustrous in light – after circulating this lustre gradually dulls. A polished coin usually has a hard or harsh shine to the surfaces so polishing is easily distinguishable from original lustre or mint bloom. After light circulation the bloom is often lost from the higher surfaces but remains on areas of the coin’s surface which are protected such as in the crevices of the design or in the field around the legends. Further circulation finally removes all traces of this lustre. On Irish modern coins the gaps between the harp strings can often remain lustrous long after the rest of the surface is dulled. This term refers to the main objects and legends on the coin. 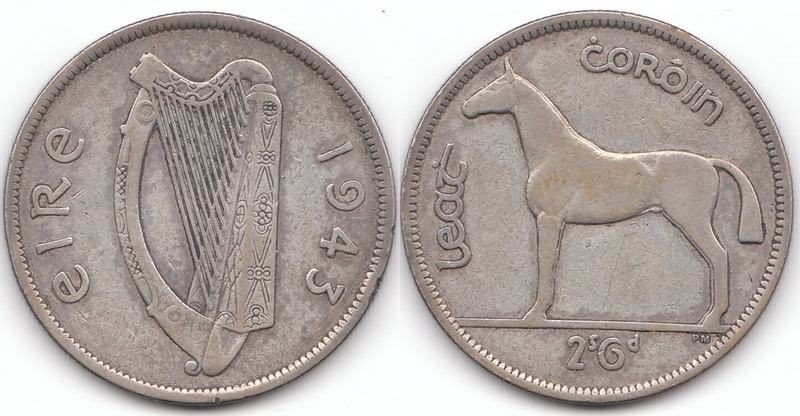 In the case of an Irish modern coins the term design refers to the harp and the reverse animal as well as the legends (writing). This term refers to the smaller components within the objects on the coins surface. In terms of modern Irish coins this means features such as an animal’s eye or feathers or on the obverse harp it means the pattern on the sound box or the bow. Some details are worn very Early in the life of a coin (perhaps by GVF grade) while some survive until the main design is little more than a silhouette. This is obviously linked to the depth of any grooves in the detail when the coin was minted. The harp strings on a modern Irish coin are design, not detail. They are usually visible along with the rest of the harp silhouette until a coin is worn beyond Fair. Coin Rarity For many years, the only method of reasonably identifying rarity was with the use of Sheldon Scale. This scale was designed at the time to identify rarity of Large Cent varieties of the USA. In this case, the Sheldon Scale worked very well, as mintage figures were relatively low. No question. The Sheldon Scale was further adopted for use with many other series and denominations, as it was the only common scale in existence. However, it was not quite appropriate for most series, most varieties, or even most errors. The Sheldon Scale was simply a progression of eight levels, in which the population of all Large Cent varieties were to fall, and was prefaced with the letter “R”, indicating a rarity. However, this scale is very subjective and it is very much open to interpretation by both collectors and dealers – much confusion followed. It all has to do with what is relative and was never satisfactory. It is quite obvious from the above that another scale was desperately needed by the hobby for indicating rarity of all coins. A method that could be used for any coin series, from any country, and any rarity. In fact, this can be used not only with coins but with virtually anything when rarity, scarcity, or availability was important. The Universal Rarity Scale (URS), which as its name implies, is universal for any coin or item. Bowers outlined his scale as recently as June 1992 (The Numismatist) and it has been adopted by many writers and modern coin catalogues. The Universal Rarity Scale is a simple mathematical progression and it can easily extended to allow for larger mintages. As you can see by the Universal Rarity Scale (URS), the mathematical progression is simple, i.e. the second figure keeps doubling. As such, it can be applied to any item as an indication of rarity. However, when using rarity numbers with coins, there are a couple of important things to remember. One, rarity generally differs from one grade to another, e.g. the 1943 Irish florin is listed as URS- 8 (between 65 and 125 known to exist) and most of these are offered in the lower grades, then it may be true to say that in ‘Uncirculated’ condition, this coin is extremely rare – say URS- 3 or URS- 4. Alternatively, the supply may be permanently low as in the example of the Charles I double pistole (Blacksmith money) where 10 examples exist but only 2 will ever be offered for sale since the others are kept (in perpetuity) in public collections, i.e. the coins are URS- 5 but the actual supply is URS- 2. Conversely, there could be many thousands of a variety known, but if many thousands more collectors were interested in obtaining one, the premium over the normal value of the coin would be greater due to the high interest factor (demand). Therefore, demand is often more important than supply, e.g. 1986 Irish Ten Pence (large). In all grades, the pre-decimal halfcrown (1961 Mule variety) is far more expensive than the 1986 decimal 10 pence piece. The halfcrown’s mintage figure is estimated to be almost 5 times that of the 10p. The reason for this price difference is probably due to there being more collectors of Irish pre-decimal coins than less popular Irish decimal coins. In this instance, an excess of demand over-supply determines the price. In addition, we have no way of knowing how many of each year were withdrawn by the Central Bank of Ireland before or after Decimalisation Day in 1971. Mintage does give us an idea of initial supply. So, how do we determine (or estimate) the demand ? One method would be to study Irish coin values and see if there are any obvious trends, e.g. the Irish ½d. In the table above, we can see that the key date is the 1939 halfpenny but the 1940 in EF upwards closely follows the 1939 market values. This is probably due to coins in EF or Unc condition being genuinely scarce and, as such, the URS for EF and Unc would be far lower than the URS for VF or F. However, if you look at the market values for the 1946 halfpenny, you will see the price almost doubling that of the 1940 halfpenny in the lowest grade but the 1940 over-takes it from VF condition upwards. As such, we can ‘guess-timate’ that there are probably more than 750,000 but less than 1,680,000 collectors of Irish pre-decimal coins in the world today. Looking at the Irish 50p piece (and using a similar method), we might ‘guess-timate’ that are no more than 100,000 collectors of Irish decimal coinage in the world today. The price for Irish decimal coinage really only increases significantly when the mintage is <20,000 coins, so a collecting population closer to 20,000 might be more accurate, e.g. the Irish pound coin of 2000 (red deer + millennium) was minted in 40,000 and 50,000 pieces, respectively and no noticeable price increase occurs compared to the other years where there were tens of millions minted. Therefore, 40,000 coins seems to be more than adequate. An interesting aside is that in the 14th and 15th centuries we know of several Acts of Parliament that gave permission to certain individuals to mint specific coins but no examples have ever been found. These coins have been listed in the O’Brien Coin Guides and have all been given URS- 0 scores. This an example of where if any are ever found in a hoard, their rarity score will have to be revised. Interest factor is a term used at times to indicate just how much demand a particular coin or variety might have. A variety with a very high interest factor would be in high demand, with several thousands of collectors desiring the variety. A medium interest factor may indicate that the variety is desired by hundreds or a few thousand people, and a low interest factor might indicate that the coin is sought by just a handful of collectors, e.g. there are relatively few collectors of Irish decimal coinage compared to the pre-decimal series. The interest factor, combined with the rarity, help to determine the value of a certain variety or error. However, the eye appeal of the variety or error is also a contributing factor and must be considered in the final evaluation. A very important part of eye appeal is the relative strength or visibility of the particular variety or error, e.g. relatively few people can spot a 1961 halfcrown mule variety, whereas a silver proof 1928 halfcrown is a truly spectacular coin to look at. As a variety receives more publicity within the numismatic press, the Interest Factor may rise as demand increases. This may cause the price or value of certain varieties (and errors) to increase without any change in the estimated quantity available. On the other hand, if a large quantity of a variety surfaces, the value of that variety may decrease as the supply outstrips the demand. For example, the 1943 florin will always be the focus of attention in any collection and an auction house will always highlight an example in their catalogue. Similarly, any Morbiducci patterns will attract a lot of attention and similar prices – despite being of much greater rarity than the 1943 florin. As in other segments of collecting hobbies, a combination of supply and demand almost always dictates the price or value of a particular variety.